Villagers in Hoa Binh Province Vietnam are using the Internet to lure tourists and spread the word about their goods. In searching for a vacation destination, Korean tourist Kim Min-seung turned to the same source he may have for movie times or news: the internet, and found himself in Vietnam. Kim said his group of ten discovered the country's virgin landscape, (particularly the hand-made brocade of Mai Chau District in Hoa Binh Province, about 120km north-west from Hanoi) through the internet first before deciding to travel and see the beauty of the region first-hand. "We enjoyed a homestay at Mai Chau District's Lac and Poong Coong villages with the countless colourful stalls of brocade lining the roadside and almost every house in stilt was a sale outlet. 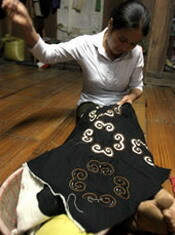 "We also joined local people in weaving brocade. The process is so attractive and interesting. Each of us took home several sorts of brocade products as gifts for our family and friends," Kim told Viet Nam News. Nguyen Huu Hung, who owns a textile weaving enterprise in Lac Village, owes his gratitude to the internet, which brings local and foreign travellers and business to the area. "Our enterprise is thriving as a result of our efforts to expand the market. We're using IT to advertise our hand-made items to customers and get their feedback to update designs to meet their demands. We also sell our items on-line. "Through the internet we can exchange views with our partners abroad on how to make traditional brocade desirable to western people and we often ask them how to improve our items' quality, using local materials along with the latest models and designs. "Apart from working at the workshop, my main job is to check emails, to answer customers' orders or negotiate with my partners in Japan, Sweden and South Korea to export our items to them. Almost all my 100 workers have access to the Internet," says Hung. Without access to the internet, Hung was faced with many hardships including higher costs, particularly when working with foreign partners and customers. "When sending a model to my partner to be approved I had to wait for a week or longer and pay for postage, but now it takes just five to seven minutes to get their feedback. "Although initial investment for installing the Internet and a website was a bit expensive, it's given profitable and long-term results. I hope the internet will be further developed in the mountain region, creating favourable conditions for ethnic groups to boost production and cultural exchange with the rest of the world," said Hung. Since the internet came to these two villages in 2004, local living standards have improved remarkably thanks to tourism development, said one district official. He said many households in his district have access to the internet and use it to promote tourism in the area and advertise their traditional products. "The Hoa Binh Provincial Post offers ethnic groups an internet compulsory programme in 50 out of 190 communes. The remainder are expected to join the programme this year," he said. Mai Chau is now widely known among domestic and foreign travellers for its traditional lunch served by a host family. Giving their ears a respite from the incessant noise of city life, tourists can sit back amid the beauty of the natural landscape and soak up the gentle rhythm of rural life; the dull clatter of pots and pans being readied for the mid-day meal or the sound of an old woman murmuring softly to her young grandson. This simple lifestyle is one of the area's main attractions and the best way to get the most of it is the most straightforward - going for a walk. If you come with an organised tour from Hanoi you can also trek throng the mountains or if you feel like going a bit faster, hire a bicycle from one of the locals. Once you're ready to put your feet up, there are nightly dance performances at the stilt houses. Perhaps the best testament to Mai Chau's charms are the lengths that people will take to get there and the public bus ride from the capital city to Hoa Binh station on Highway 6 is certainly a character-building journey. The road, winding over the most spectacular mountain scenery outside the far north, provides a hair-raising roller coaster ride punctuated by the sound of people retching into plastic bags. The bus pauses at a 'fast food' stop high in the mountains so passengers can refuel with some delicious roasted maize sold at the roadside and fill their lungs with some fresh air in preparation for the rest of the journey. For those with more sensitive stomachs, you can always find your way by motorbike. If you want to take your time along the road, this is really the best option. One of Kim's Korean friends agrees: "We kept wanting to stop to take photos along the road to Mai Chau before arriving at Lac Village. The scenery become more and more amazing with every corner of the road." Sitting between the fierce Da and Ma rivers, Mai Chau is the gateway to Vietnam's vast north-western mountain region, home to various ethnic groups including the Thai, Muong, Dao, Mong and Hoa. It has been a popular destination for bold tourists since the early 1990s. Small groups of travellers would head to the area - about 40km north-west of Hoa Binh Province - and take off not knowing what they would find, deputy chairman in charge of culture and tourism from the district People's Committee Le Quang My says.Visitors would stumble across the villages of Lac and Poong Coong, nestled in a mountain valley. Along with the beauty of the natural surroundings, tourists would be warmly treated by the local people and get a glimpse of a traditional lifestyle that has changed little over the centuries. The growing number of visitors prompted local authorities to develop ethnic community-based tourism as a major money-maker for the district, My says. "Since 2003, the number of visitors to the area has increased tenfold. The district earned some VND2bil from tourism last year." The district is now looking to expand the area from a quiet getaway spot to a more exciting destination where tourists will be tempted to stay for longer periods, he says. The Viet Nam Administration of Tourism has already pumped some VND10bil into making this plan a reality.